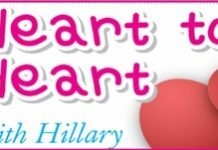 Home Blogs Heart to Heart with Hillary Anyone for a transplant? I am a new transplant to Pattaya. Today was my first day reading your newspaper. I simply could not stop laughing hard after reading your brutally honest responses to people’s queries on June/8th publication. Total respect and salutations to you Hillary. An interesting name you have chosen for yourself, my Petal. You should be very careful round here as there are some stunning creatures roaming the streets at night, looking for a transplant. Especially new transplants! Stay indoors for a month or so before venturing out into the wonderful world of Pattaya.